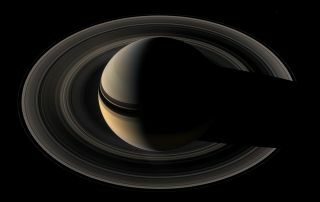 Saturn and its rings are the jewel of the solar system, but the gas giant's lack of a surface means humans won't likely find a foothold there. Saturn's moons Titan and Enceladus, however, might be better choices. Without a solid surface, Saturn isn't likely a place we could ever live. But the gas giant does have numerous moons, some of which would make fascinating locations for space colonies, particularly Titan and Enceladus. Saturn's icy moon Enceladus is seen with Titan, the largest Saturnian satellite, in the background in this view from NASA's Cassini spacecraft captured on Feb. 5, 2006. Enceladus and Titan may be attractive targets for future human explorers. "If you were in the outer solar system and you had to make an emergency landing, go to Titan," NASA astrobiologist Chris McKay told Space.com. Based on these facts, scientists believed the moon had a global ocean of methane, so when NASA planned the Cassini mission, they designed the Huygens probe as a boat. But when Cassini was halfway to Titan, Hubble data showed the moon's surface wasn't pure liquid, and may only contain regional seas. Huygens and Cassini later confirmed this in 2004 and 2005. If you lived on Titan, you wouldn't need a pressurized suit to survive; all you'd really need is an oxygen mask and very warm clothing, McKay said. In terms of pressure, standing on the surface of the moon would feel similar to resting at the bottom of a pool on Earth. Titan's surface is covered with dunes and rocks of water ice, and the moon has networks of methane lakes, rivers and seas concentrated at its poles. But aside from these features, Titan is pretty flat, and lacks the numerous craters and giant mountains seen elsewhere in the solar system. With formations that are only several hundreds of yards high, "you're not going to set records climbing mountains on Titan," McKay said. Saturn's largest moon Titan has a thick, smoggy atmosphere and is home to vast lakes of liquid methane, which are visible in this image as darker blotches in the moon's upper right. Titan's largest sea is called the Kraken Mare. But because of Titan's low gravity (it's about 14 percent of Earth normal) and dense atmosphere, you could jump off a high spot and use your coat to glide down. "Hang gliding would take on a whole new meaning," McKay said. The sky on Titan is a perpetual hazy orange during the day (Titan's day is about 16 Earth days). If you lived on the side of the moon permanently facing Saturn, you could see the massive planet through the haze. Titan's thick clouds occasionally rain down liquid methane. During the moon's long summer (Saturn takes 30 years to orbit the sun), its polar regions experience "Texaslike thunderstorms," McKay said. However, the moon doesn't have any tornadoes or other cyclones. Living on Titan, you'd also be safe from cosmic rays and moonquakes. "It's a pretty benign environment," McKay said. Saturn's icy moon Enceladus is home to many icy geysers at its south pole as seen in this view from NASA's Cassini spacecraft on Nov. 30, 2010. Similar to Titan, the main danger of living on Enceladus is the frigid cold. The moon's icy surface reflects most sunlight, resulting in temperatures averaging minus 330 F (minus 201 C) throughout the day (1.4 Earth days). The best location for a base on Enceladus would be close to its "tiger stripes," which are cracks in the surface at the moon's south pole. Here, giant fissures spew plumes of frozen ice particles and cold vapor into space. In all, this region produces about 15.8 gigawatts of heat-generated power, which is roughly equivalent to the output of 20 coal-fired power plants. "If you build your base fairly close to the tiger stripes, you might have a source of heat you could tap into," Cassini project scientist Linda Spilker told Space.com. Scientists think the south pole's plumes come from a potentially life-harboring ocean located beneath the moon's 19- to 25-mile (30 to 40 kilometers) thick ice shell. If you were living near the tiger stripes, you'd probably want to drill into the ice and explore the ocean for signs of life, Spilker said. Enceladus is only about 300 miles (482 km) in diameter, and could easily fit between Los Angeles and San Francisco. Despite its diminutive size, the moon has several different types of terrain to see, including craters up to 22 miles (35 km) across, plains and ridges. But the moon's tiny gravity (just 1 percent of Earth's) would make walking between these features a bit difficult. And whether you lived on Titan or Enceladus, life could get lonely — a message sent home would take at least 1 hour and 20 minutes.